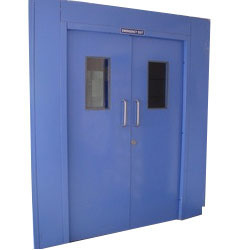 We are among the prominent manufacturer, supplier and exporter of industrial steel doors. Our range are highly appreciated by our clients for its better quality & durability. We are a leading manufacturer, supplier and exporter of a comprehensive gamut of Industrial Steel Doors. Our offered product range is inclusive of Industrial Doors, Metal Doors, Fire Doors, Steel Doors, Clean Room Doors, Economy Doors, Sliding Doors, School Doors, X- ray Proof Doors. Our products are highly appreciated by the customers for meeting the highest prevailing quality standards.